Episodic gaming is becoming a regular occurrence on the Wii and DSiWare services, and whether that’s a good or bad thing is completely up to the individual. It is true, however, that if the first episode in a series isn’t very good, then there’s a chance that it won’t get much better moving forward. 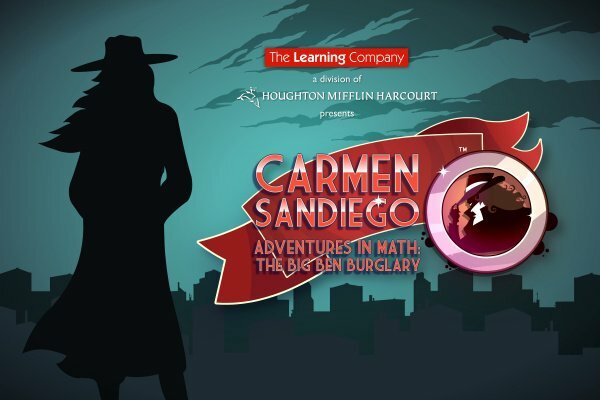 Carmen Sandiego Adventures in Math: The Big Ben Burglary is a perfect example of this phenomenon. Much like the first in the series, this game tells the story of an absurd heist involving an international monument and a ridiculous villain. One of Carmen Sandiego’s cohorts from V.I.L.E., the criminal organisation the Sandiego heads up, has stolen the Big Ben bell from the Houses of Parliament. By gathering clues and solving a series of puzzles, it’s up to you to solve the mystery of who committed the crime and bring them to justice. The gameplay in this installment is exactly the same as it was in the first; if you’ve already played Carmen Sandiego Adventures in Math: The Lady Liberty Larceny then you know exactly how it works. 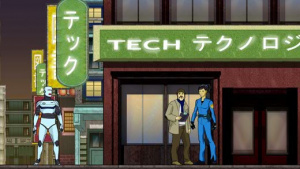 This game is a point and click adventure in which you must solve puzzles that are given to you by characters populating the environments you explore, much like any of the Professor Layton games. Using your Wii Remote as a pointer, all you need to do is aim at the screen and press A to click on the characters you want to talk to or parts of the puzzles that you want to interact with. The pointer can also be used to find hint coins hidden in the various environments; these give you a little extra help in a puzzle if you need it, much like any Layton game. As the Carmen Sandiego Adventures in Math series is truly an edutainment series with a whole lot of charm, all of the puzzles in this game are somehow related to math, whether it be multiplying and dividing fractions to open a special lock on a door or something as simple locating a specific spot on a graph. 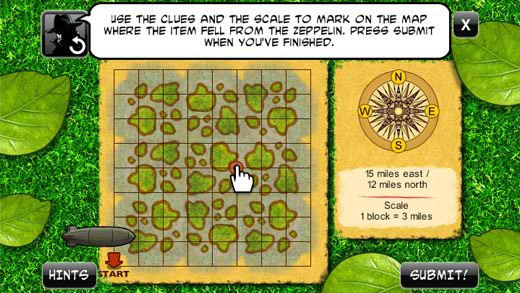 Each puzzle that you solve will help you with the bigger mystery by opening a new area, giving you a new item to trade for information or simply by pointing you in the right direction. 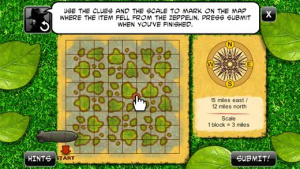 Each puzzle also gives you a certain number of points depending on efficiently you solved it; these points work much like experience points that allow your character to advance to a higher rank, but there’s no explanation of this in the game, and being at a higher level doesn’t change gameplay at all. In short, the experience points and levelling system are completely arbitrary. Unfortunately, much like The Lady Liberty Larceny, this whole game is over in no time at all. There are only ten different puzzles to solve (several of which are recycled from the first game), and nothing changes with each time you play through. All of the puzzles are always the same ones, and the over-arching mystery stays the same as well. Without any change to the format and nothing to unlock, there isn’t much incentive to play through this adventure more than once. Being the second instalment in an episodic series, it’s expected that the graphics and soundtrack haven’t changed at all: the visuals are still underwhelming yet charming, and the music follows suit. That’s not to say that the presentation doesn’t fit the whimsical and easygoing mood of the story, but any type of change would have been welcomed. The one intelligent thing about these episodes is the ability to carry your character profile from one game to the next. Assuming you’ve played the first in the series, and then didn’t immediately delete it from your Wii console upon completion, you’ll be able to play as the same character that you played as in the first game. To use your same character, simply create a new character with the same name as your original, then the game will automatically ask if you want to transfer information over from the first game. While this may not put new players at any significant disadvantage at all, it is a nice touch being able to retain all of your hint coins and experience from solving puzzles from your first playthrough. 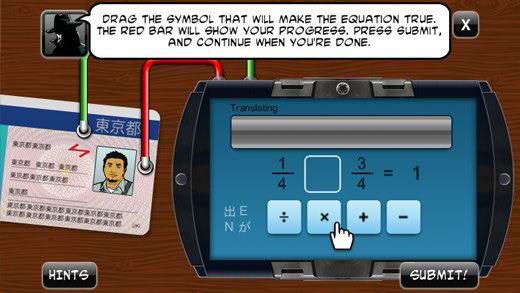 If you enjoyed the first game in the Carmen Sandiego Adventures in Math series, then there’s no reason for you not to get this second one. Carmen Sandiego Adventures in Math: The Big Ben Burglary doesn’t add to the already existing formula established by the previous game, but at the same time it doesn’t take anything away either. For 600 Points and only an hour’s worth of gameplay, newcomers might want to stay clear, but fans of the first won’t be disappointed. Where in the world is quality in licensed games? Wait, I just did a Wikipedia and learned Carmen Sandiego was originally a game. Geography, not 'rithmetic, though. @Jumbif You didn't know that? I thought that was common knowledge. Maybe I'm just getting old. By the way, it was also at one point a game show on PBS. Hey, SBCG4AP and Half-Life most certainly improved over time. Also, lol at the fact that this (and ep. 1) was released. I just finished the first game, I'm a sucker for Carmen Saniego. I plan on getting this next week, and I'm glad to here our character data carries over. I quite enjoyed the original Carmen Sandiego games back in the day and they came with a really thick travel atlas thingie book but this doesn't look anything like the old games. I'm a huge Carmen fan. I own Where in the World and Where in Time on my Genesis and I know the game show's theme by heart. (Rockappella ftw!) But this just doesn't seem like it should be on WiiWare... maybe Wii retail, but not here. Not for me. I'll pass. It's probably best he got kidnapped in the offseason. They can keep him ransom until training camp and (hopefully) he won't do anything stupid.